According to Southern Baptist Missions Board President David Platt, Christians ought to set for themselves a financial spending cap. The justification for this principle can be found in the admonition that godliness with contentment is great gain. Interestingly, Platt is not providing this advice so that you might provide better for yourself in the rocky times ahead likely to result from a declining economy. Instead, you are expected to give the abundance away (no doubt towards programs from which Pratt’s own bottom line will ultimately benefit). Perhaps the first extraneous expenditure Christians ought to eliminate from their budget should be the purchase of any books published by Pastor Platt. Secondly, if we are to live our lives in a hyper-Biblical fashion, perhaps Christians should cut donations to Christian organizational bodies found nowhere in Scripture. The first of these coming to mind might be none other than the International Missions Board of the Southern Baptist Convention. Online POLL to pick, Chaplains Corps – Shield / Badge… VOTE NOW ! Okay folks. We need your help. 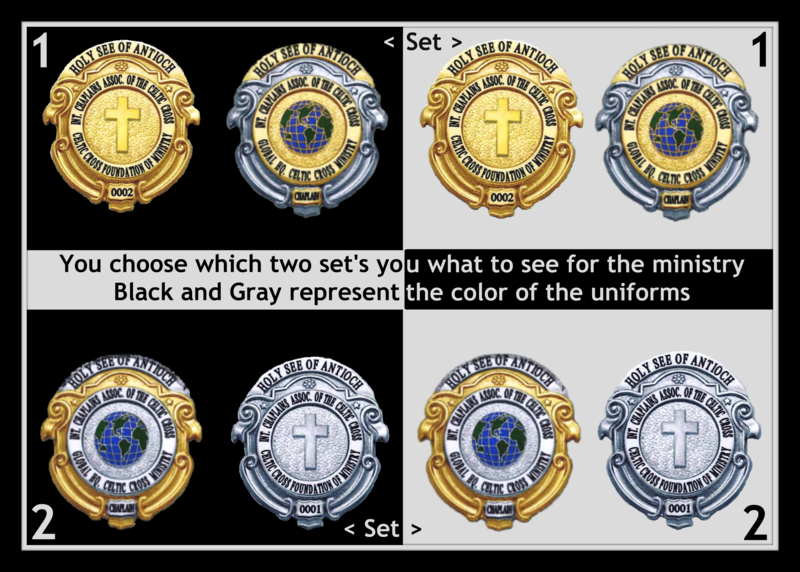 Were taking a POLL, to see which of these two sets of Chaplains Corps Shields / Badges, you like best. This will be an ongoing POLL with the announcement being made of the winning set on Monday, APRIL 6th. The day after Easter Sunday. You can go to the ministry website and vote. Only one Vote per person. We will be watching and counting as well as having this POLL posted in other parts of our Social Media sites. So please we want this to be your choice because this is your ministry and church and were here to serve you, the best ways we can. This entry was posted in CCM's Virtual Chapel, Christian Warrior Network, News and politics, Religion, Show your Support for the United States of America and those who serve., Uncategorized and tagged Badge, Celtic Cross, Chaplain, Chaplains, Chaplains Corps, Choice, choose, Holy See of Antioch, Ministry, Pick, Shield, Vote. Bookmark the permalink. Is Stratospheric Goo Proof Of Extraterrestrial Life? Should We Mock A False Religion? God plants seeds of greatest in us as we fast.